While it isn’t even close to summer for many of you, in Central Texas, where the other day it hit 85F, it’s pretty much on. Oregon summers can be hot, but with the efficient and effective central air conditioning of my last home, I never gave a second thought to the safety of my perfumes in their cabinet. Not so here. The humidity is high, the heat even higher, and our apartment is so inefficient, it might as well be clap-board. So I packed up all, yes all!, of my bottles and refrigerated them. At first I planned to pull out a few at a time, or just go fridge diving each morning after choosing a SOTD (the boxes are still nicely displayed in the cabinet, for window shopping purposes), but then I realized that it’s the perfect opportunity to work my way through all of my 1mL samples, and newer decants. Those things don’t last forever, you know! Many of the samples have been tested, others not. I may write about a fragrance that’s already been reviewed here at some point in the past, but these posts are meant to be the 1mL (snippet) version of The Perfume Review. I’ve convinced Dionne and Anne-Marie to join me (though it’s still pretty darned cold in Canada, and summer is ending in Australia) and I hope that these little snippets will be fun for all, no matter what the weather where you’re at. I’ll see you tomorrow as we kick off Sample Summer! 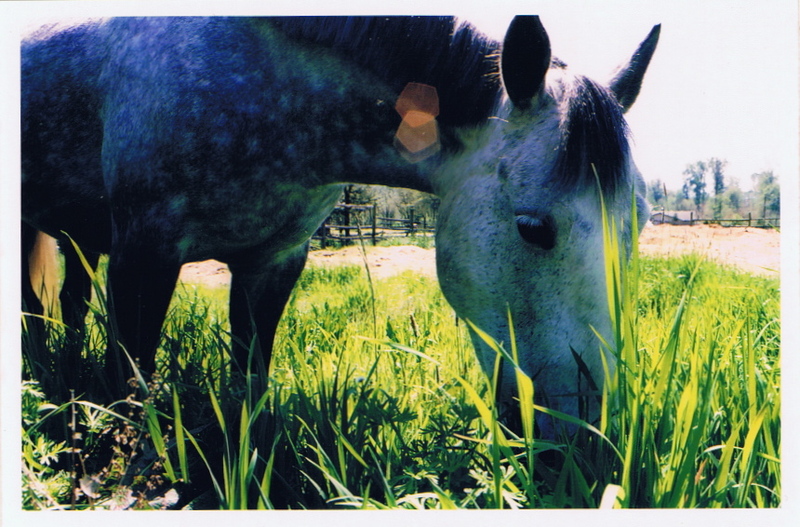 Above image is my mare, Dagny, on a bright summer day in 2007. Beautiful mare. I love her dapples. Looking forward to all the 1mL reviews. I live in Sunny Southern California, and I never think about fragrance in terms of seasons, as we barely have them! I just wear what I am in the mood for…I look forward to your writings! I told Archimedes about this upcoming project and your joke that he should help pick a snazzy title; we then got riffing on possibilities. Some were relatively simple, like Sample Season and Season for Samples (this prompted an outburst of singing, “We had joy, we had fun, we had samples in the sun….”) but these were deemed too boring. One possibility was A Seasoning of Samples, which plays on the mini-review aspect. I came up with Raiders of the Lost Stash, which I think is funny, but he vetoed. (Hey, pick that, and I can *nyah nyah* at him!) This devolved into further geekery: Return of the Sample, Perfume III: The Search for Samples, BoTo and the Chamber of Samples, Lord of Perfumes: The Return of the Sample, Vials of Glory… yeah, we really got going. How about Hot Time: Summer in the Scents…..
Judith, one of the reasons why Dee told me to consider possible alternatives to Sample Summer is because I teased her about the summer thing – the weekend I got her e-mail suggesting this we’d had a big blizzard. We’re still 6 weeks away from even getting leaves on the trees. Whatever it is called is fine, and as I said, I live in spring/summer all year ’round…I just look forward to the mini reviews! I feast on reviews.. I had to stop reading some ‘blogs’ for a time, I was on overload, but I am back with a vengence! Oh I do like Raiders of the Lost Stash. So there! Vials of Glory is good too. Maybe a different tittle for each entry???? To borrow Dee’s phrase: mini-reviews are tops, so I look very much forward to them! May I suggest: Dirty Sampling, Good Will Sampling or Samples Like It Hot (the last would be especially good for the Texan climate). Bones (18yo Son #1) pointed out that it should be “Lord of the Perfumes: The Return of the Sample” – shame on me for missing that pivotal “the” – and he prefers Sample Journey III: The Search for Scent as a Star Trek shout-out. ROTFL! I love all these suggestions! Mini-reviews *are* tops— no matter what they’re called, I’m looking forward to them… Especially since my next planned review is Opus VI, and that is coming along s l o w l y ! Hey, I’m too remember! I’ve got plenty of neglected little fellas lying around. Short reviews will be good discipline for me. I do tend to get carried away! Hooray! I’m glad you’re going to do it too! I’ll update the posting… This is going to be fun! I. Love. Mini. Reviews. Great idea. Can’t wait for Samples Like It Hot! Love mini-reviews! Looking forward to whatever snazzy title you pick for these… might steal one of the unused suggestions, too. I’m excitedly anticipating the summer… soon we’ll know if Texas is going to work as Home (I sure hope it does, because I’m really liking Austin). The fam started brainstorming last night during supper, and had a grand time coming up with even more names, some specifically about samples, others just perfume-related. The Sample Menace!!! OMG! I love it, lol!! haha, you guys are so rad! Huffy the Sample Slayer is my personal favourite!